Posh midfielder Harry Beautyman impressed manager Darren Ferguson in the defeat by Preston. Photo: JoeDent/theposh.com. 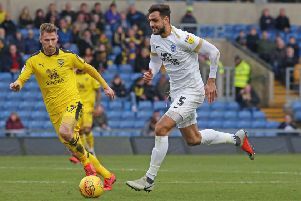 Peterborough United manager Darren Ferguson was still making optimistic noises despite a fourth home League One defeat in a row today (December 20). High-flying Preston won 1-0 at the ABAX Stadium with a goal in first-half stoppage time from striker Jermaine Beckford. Posh mounted a strong fight-back in the final 20 minutes, but couldn’t break down one of the division’s meanest defences. Posh have now won nine and lost nine of their 21 League One matches and yet are still just one point outside the play-off places. And Ferguson saw enough spirit in his side to suggest they will soon see an improvement in results - as long as they stop conceding soft goals and show more composure at the other end of the pitch. “We were a bit unlucky to lose today,” Ferguson insisted. “To lose a goal like we did from a throw-in in the last minute of the first-half was poor from our point of view and we spoiled some decent attacking play with some rash play. Our end product was awful at times. “We worked ourselves into good crossing positions and yet couldn’t pick out a man in the penalty area. Some of our shooting decisions were also very poor. “It all meant that once again we have lost when we shouldn’t have lost. The difference ultimately between the sides was the bad goal we conceded. We warned our defenders that Kevin Davies likes to flick the ball on for Jermaine Beckford in the penalty area and that’s exactly what happened. “We can’t keep losing goals like that, but at least after this game I’m confident that our fans will have gone home thinking that we had something about us. I’m not sure anyone would have said that after our last home game against Bristol City. “Preston have won seven times 1-0 away from home this season and that’s no co-incidence. They are very well-organised and very efficient, but we stretched them at times towards the end and deserved a goal. “We obviously have to stop the mistakes and improve the results, but I left this game with enough optimism to believe that we can get to where we want to be. The last 25 minutes were frustrating because we couldn’t work a good enough opening, but we also played some decent stuff. “There were lots of positives. Erhun Oztumer was good again and Harry Beautyman was excellent. Harry almost pulled out of the game beforehand with a thigh injury, but you’d never have known it from the way he played. “He gets up and down the field and shows great energy. Newell missed the match after picking up a red card at Lyeton Orient last week (December 13). Star man Marcus Maddison was again absent from the matchday squad with an ankle injury. Newell will return for the Boxing Day clash at Chesterfield, but Maddison remains a doubt. He suffered another knock on his ankle in training yesterday (December 19).